Dealing with weeds in your lawn or garden might cause you to lose your patience. It’s because taking care of these supposed to be beautiful areas of your home can become costly and hectic when there are weeds that seem to crop up constantly. Note that while some of these weeds are quite easy to get rid of, they still have the tendency of growing again within just a short period. With the best weed killer, however, you can prevent them from growing ever again. Through a high-quality weed killer, you can easily control and kill weeds and prevent them from ruining the look of your lawn or garden. Note that proper garden and lawn care can help enhance the beauty of your home. It plays a major role in any home improvement project considering the fact that it also works in increasing your property’s value. It can bring out the best in your home, so it’s a must to look for the most effective weed killer that will guide you in ensuring that it continues to bring out its excellent condition. What Should You Know Before Buying a Weed Killer? How to Use Weed Killer Safely and Successfully? Before investing in the best herbicides or weed killers, it’s essential to become familiar about its different types first. Note that there are two common types of weed killer – the pre-emergent and the post-emergent. Understanding how each of these types of weed killer works can help you pick the most suitable one for your specific needs. It is crucial to note that this type of weed killer is incapable of stopping the whole weed germination process. What it does is that it interrupts the process prior to causing a sprout to push through a soil. One example of this type is a crabgrass killer and preventer, which works by preventing the seeds of crabgrass from growing new plants. If you’re planning to use this type then it’s advisable to treat the whole lawn area. Note that missing a spot might only cause weeds to sprout there. You may also use the post-emergent herbicide if you’re planning to handle annual broadleaf and perennial weeds. These refer to weeds shaped like leaves but don’t resemble grasses. This type can also control weed and grass. You can pick the post-emergent type if you wish to control and kill the weeds in your lawn. It is also an effective choice during the start of the spring season when plants already begun to grow. Note that once plants begun growing, it’s a bit too late to prevent germination using the pre-emergent type, so it would be best to go for the post-emergent weed killer. Aside from learning the two mentioned types, take note that weed killers also work based on two ways – the contact and systemic application. Systemic – A weed killer for lawns that works using the systemic application tend to be brought by the foliage. It is then transported to the remaining plants, including the roots. The systemic lawn weed killer can be expected to inhibit the growth of weeds in a hormonal manner by minimizing the amount of chlorophyll and protein present in the plant. It often takes around two weeks for this type to eradicate the plants completely and produce visible results. Contact – If you want to know how to get rid of weeds forever in a specific area then the contact weed killer is probably the best solution for you. It attacks a specific weed or some weeds that thrive in a specific area. It works by killing the plants only or their parts. It is also known to be fast-acting. It is appropriate for annual weeds. While it is incapable of killing the roots, it is effective in weakening the plants through repeated applications. When trying to get to know more about weed killers, you may also come across the terms selective and non-selective. A selective weed killer won’t be able to kill all vegetation it comes in contact with. It tends to kill the weeds only while leaving the remaining grasses in your lawn. With that, it’s an ideal choice for you if you have an established loan. The non-selective type, on the other hand, tends to kill almost all that it touches. These include flowers, veggies, and grasses. This makes this type ideal if you want to clear some areas of your ground or lawn. 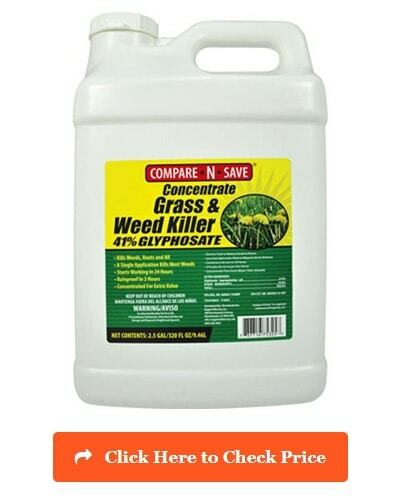 Compare-N-Save Concentrate Grass & Weed Killer is a non-selective contact & systemic weed and grass killer, which works well in dealing with post-emergent weeds. It has up to 41% glyphosate, which makes it effective in killing unwanted weeds while preserving the other plants in your lawn. It is available in weed killer concentrates form, which is the reason why it mixes effortlessly with water. Mixing around 3 tbsps. of this solution with 1 gallon of water is often enough to produce a solution capable of treating a 300 square feet area. The different sizes of this product, though, are capable of treating areas around 25,000 to 63,000 sq. ft. It also tends to produce visible results in as little as 2 to 4 days. It would be best to apply this product during the warm summer season when there is little to zero chance of rain, especially within 24 hours after you applied it. It is because you can only expect it to be rainproof within 2 hours. While it can’t prevent new or future growth, existing ones will surely be weakened with this concentrated solution. What’s Special about the Product? This product is special in the sense that it is capable of treating a really wide area. In fact, it can treat up to 63,000 square feet. Another special thing about this concentrated solution is that it lets you experiment using different doses, depending on the specific types or species of weed you’re treating, their sizes, and the kinds of fruits, veggies, and plants present in your home. It’s versatile as it lets you use it in various applications. You can use it in your walkways or driveways to get rid of weeds and grass. It’s also suitable for use on garden fences, helping you maintain the cleanliness of your property. Furthermore, it works around shrubs, trees, and flowerbeds without negatively affecting the proliferation of your favorite plants. Grasses the Product Kills: Annual bluegrass, Chickweed, Crabgrass, Redroot pigweed, Tansy mustard, Witch grass, Ragwort, Pennsylvania smartweed, Wild mustard, Dandelion, Bermuda grass. If you wish to invest in the best natural weed killer then it is highly advisable to check out this popular product from Doctor Kirchner. It is an all-natural, non-selective, contact weed killer, which means that it is safe to use while working effectively in killing all types of grasses and weeds you are targeting. Just make sure that they are in their post-emergent form as this weed killer is designed to work in that case. Since it is all-natural, you can also consider it as a weed killer without glyphosate or any harmful chemicals. Even without glyphosate, this natural weed killer is still fast-acting, allowing it to give you the results you wish within just an hour. The majority of the sprayed or targeted weeds will also be killed overnight. Also, rest assured that its rainproof protection will be activated within 30 minutes to an hour. One special benefit of this weed killer is that it is safe, organic, and natural. It even serves as one of the best gift ideas for someone who wants to deal with his/her weed problems in a safe and natural manner. It is non-toxic, too, which means that it is friendly to the environment while being totally safe to your pets and the people around your home. This solution is composed of ocean water and vinegar, which is very convenient to use because it does not require mixing. It’s also designed to kill the roots of the weeds quickly without causing you to worry about the potential effects of harmful pesticides. Grasses the Product Kills: This product is non-selective, which means that almost all types of grasses will be killed from any contact with it. This makes it suitable for use on mulched areas, pool decks, hardscape, borders, gardens, and pavers with grasses and weeds you want to eliminate completely. 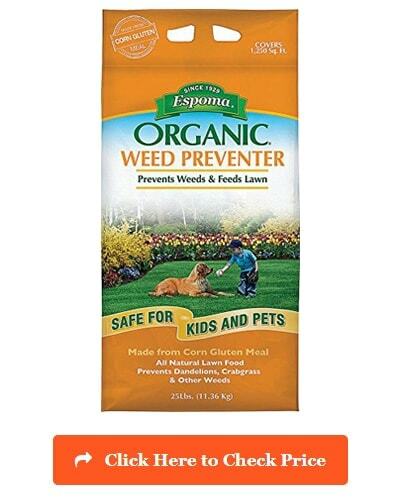 If you are seriously considering of investing in a kid and pet-friendly product then the Espoma Organic Weed Preventer is worthwhile to check out. It’s one of the best organic weed killers you can find in the market as it is all-natural and guaranteed to be one hundred percent safe for both kids and pets. It is a selective and systemic weed and grass killer, which guarantees an excellent performance when used on pre-emergent weeds. It has a 25-lb. pack capable of covering an area of up to 2,500 square feet. You can actually apply this organic weed preventer two times every year, preferably during the early spring and the fall seasons. It’s known to be rainproof but it’s advisable to water it lightly after applying if you don’t expect rain within 24 hours. Expect it to produce your desired results in as little as 12-24 hours. The results are also long-lasting as it inhibits the development of roots in seedlings. This organic weed preventer is so special in the sense that it can provide your lawn with all the nutrients it needs to guarantee lusher and greener growth. It makes use of an organic, pure, and corn-gluten formula, which is natural and safe for kids and pets while still doing a great job in inhibiting the growth of weeds. The formula it uses is also easy to apply. It’s a good choice if you want permanent results as it kills weeds permanently. Furthermore, it is effective in withering the vegetative condition of weeds quicker when compared to other products. It doesn’t trigger skin irritation and respiratory issues, too. Grasses the Product Kills: Annual bluegrass, Curly dock, Black medic, Dandelion, Green foxtail, Barnyard grass, Smooth crabgrass, Large crabgrass, Yellow foxtail, Orchard grass, Common Lambsquaters. 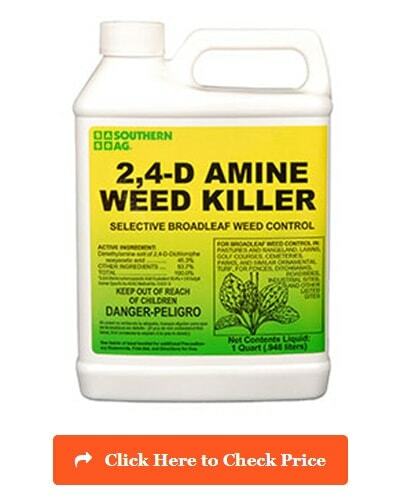 You can also pick the Southern AG 2,4-D Amine, which is a selective contact weed killer and broadleaf herbicide for lawns. It performs really well when used on post-emergent weeds. Many also consider it as the best broadleaf weed killer for lawns because of its effective performance when dealing with established lawns attacked by weeds. Capable of covering an area of up to 16,000 sq. ft., it works in attacking broadleaf weeds, including chickweed, clover, poison ivy and dandelions. It works well when applied on a day with a less than 90-degree temperature and the wind speed is below 15 miles per hour. Make sure that it is not exposed to the rain or water within 24 hours after treatment. What’s good about this broadleaf weed control solution is that it works overnight so expect to see visible results in just 24 to 48 hours. The potency of this solution also prevents the growth of broadleaf and weeds that it comes in contact with. One thing that makes this product so special is that it is a potent mixture capable of really controlling broadleaf weeds. It also works on various applications and areas, including parks, non-crop areas, and lawns. It performs well while ensuring that its effects stay for a long time. In fact, you can leave it overnight right after the application and wake up seeing noticeable results. What’s even better about this product is that it utilizes the unique and patented formula known as the 2,4 D, which works in controlling various broadleaf weeds appearing in the lawn. The formula is also on the low level, so expect it to produce favorable results even if you use it on sensitive grasses. Grasses the Product Kills: St. Augustine, Bahia, Fescues, Centipede, Rye, Blue grass, Bermuda, Bentgrass, Buffalo grass. If you are searching for a selective weed killer then the Preen Garden Weed Preventer, which works perfectly for flowerbeds, shrubs, trees, and vegetables is a perfect choice. Note that it is designed for pre-emergent weeds, too, so it won’t be able to stop and control weeds that are already existing. What it does, instead, is it prevents weeds from germinating in various areas, like around the shrubs and trees, ground covers, and in vegetable and flower gardens. You can use it to treat an area, which is around 900 to 5,000 square feet. It is also a wise move to invest in this product as you can apply it anytime during the summer, fall, or spring. It can prevent the growth of new weeds for a max of three months. This weed prevention solution is also totally rainproof so expect rain to be unable to wash it out from the soil. 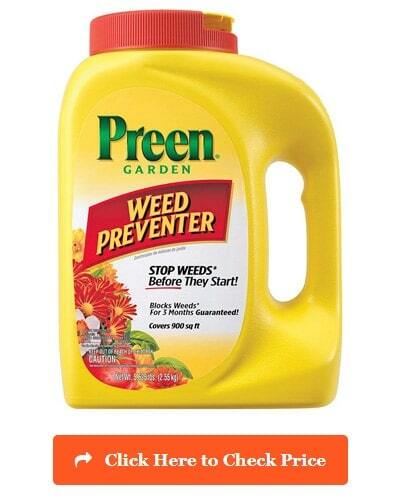 One thing that is so special about the Preen Garden Weed Preventer is that it works as a multi-functional product. Even if you are still seeding veggies, it’s still possible for you to use it to prevent weed growth by mixing it with soil. It is also useful on mulching beds. Another special feature of this weed preventer is its rainproof formula, which means that its potency won’t be diminished by rain over time. This product is also distinctive with its long shelf-life. In addition, it makes use of a slow-release technology capable of suppressing weeds for a maximum of three months. This means that it does not require frequent application to function. Grasses the Product Kills: Annual bluegrass, Cheat grass, Purslane, Stinging nettle, Dandelion, Dog fennel, Poison ivy, Prickly lettuce. Another top pick, which works for a number of environments, including the driveway, patio, hard surfaces, gravel areas, and sidewalks is the Roundup 5725070. With the dual-action formula used by this non-selective contact & systemic weed and grass killer, you have an assurance of its ability to exterminate currently existing weeds as it is known for handling post-emergent weeds really well. In addition, it is also capable of blocking the growth of new ones for as long as 4 months. It can treat a wide area – from 1,500 to 6,000 sq. ft. depending on the size you’ve chosen to buy. This weed killer for lawns and other surfaces can also provide visible results in as little as 3 hours provided you apply it during a warm and sunny weather, preferably 60-degree Fahrenheit. It is also rainproof after 10 minutes of application. One of the many special things about the Roundup 5725070 Extended Control is its versatility. It’s highly versatile as it’s suitable for use on different areas, including patios, gravel areas, driveways, walkways, flowerbeds, vegetable gardens, mulched beds, and fence lines, among many others. It also takes pride in its use of a dual-action formula designed to kill grasses and weeds to the roots, thereby preventing them from coming back. Furthermore, killing weeds using this product is easy with the aid of its sprayer featuring an extendable wand. Refilling it is also effortless as it does not involve any mixing and measuring. Grasses the Product Kills: Considering the fact that this product is a non-selective grass and weed killer, it is capable of killing or damaging all grasses or plants. That’s the main reason why you should never use it for lawn renovations, unestablished plants particularly those that are below 6 months old, vegetable or fruit gardens, and landscape beds where you expect the growth of ornamental plants within the next 4 months. 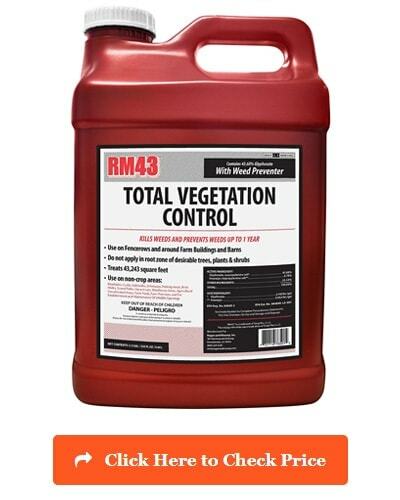 If you are shopping for the best vegetation killer that works for a larger, commercial area then you will never go wrong if you choose the RM43 43% Glyphosate Plus Weed Preventer. It can handle an area, which is up to 43, 243 square feet. It is ideal for use on post-emergent weeds and work efficiently as a selective contact weed and permanent vegetation killer. This solution can be expected to deliver an optimum performance if you apply it to weeds that are actively growing during the early summer. Once applied, it can prevent the growth of weeds for up to a year. You’ll also start seeing visible results from the application within just 2-3 days. It is also a good investment as you can expect it to be rainproof within just two hours. It is convenient to as it does not have entry restrictions for people or pets once it completely dries. This product is special because it works effectively as a bare ground treatment designed to regulate vegetation. You can use it for spot prevention, too, especially on brush vines surrounding fence rows along farm buildings, roadsides, and vacant lots. It has 43% glyphosate, which lets it perform better when killing weeds from the roots. Also, it can prevent the growth of the majority of weed species for a max of one year. This product is also popular for its cost-effectiveness since it comes in a concentrated formula. Offered at a reasonable price, you will get real value for your money because of its long shelf-life and long-lasting results. Grasses the Product Kills: Bentgrass, Bermuda grass, Cattail, Cogon grass, Fescue, Velvet grass, Western wheatgrass, Giant reed, Quack grass, Orchard grass, Kentucky bluegrass. Another of the best post-emergent herbicide that you can use is the Sanco Industries Catt Plex. It’s the ultimate choice for you if what you’re looking for is a non-selective contact aquatic weed killer. It is capable of covering an area of ¼-acre but this will be totally dependent on the type and thickness of the weed you are planning to get rid of. 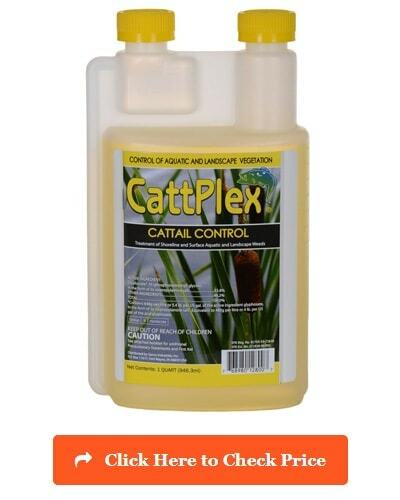 It works well in controlling and killing emerged pond weeds, such as cattails. To get the best results out of this herbicide, it is advisable to spray it on plants that are growing actively during the fall or summer. Results will most likely be visible or noticeable within 10-14 days. Also, make it a point to use this aquatic weed killer at a time when there is a lower risk of rainfall for up to 24 hours as it will only be rainproof after that period. One thing that makes this product so popular and special is the fact that it comes in a concentrated aquatic herbicide form. It does not only serve as a cattail killer. It also kills water lilies as well as other emerged or short aquatic weeds – that’s possible without harming the fish in the water. Containing around 53% glyphosate, it’s safe to say that this herbicide is glyphosate-based, making it more effective in controlling emerged weeds on ponds to the roots. As a contact herbicide, it is also advisable to apply it through the convenient spray application method. It’s also 100% safe for pets, humans, and other animals. Grasses the Product Kills: Since this aquatic herbicide is non-selective, expect it to be able to kill all types of grasses and weeds. It can kill cattails, water lilies, aquatic weeds, as well as thousands of unwanted and troublesome grasses. It also kills broad-leafed areas. 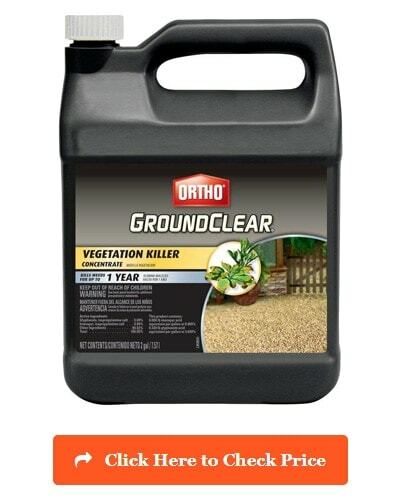 Ortho GroundClear Vegetation Killer is also one of the ultimate solutions if you’re looking for an herbicide that kills everything. It works for both post- and pre-emergent weeds, which is one reason why it’s so popular at present. It also serves as a non-selective, systemic weed killer, allowing it to handle all types of weeds and grass. Furthermore, it boasts of its decent coverage area, which can reach up to 600 square feet. One remarkable fact about this weed killer is that it’s fast-acting, allowing it to deliver favorable and noticeable results within just a few hours (usually 6 hours) after you applied it. It also works efficiently in killing weeds and unwanted vegetation and prevent them from growing again for a max of one year. It also tends to become rainproof after an hour. It’s best to use this fast-acting solution on a sunny day, particularly when the daytime temperature is at least 60 degrees F.
One thing that’s so favorable about this vegetation killer is that it lets you choose from its three convenient application methods – the concentrates, ready-to-use formula using a comfort wand, and ready-to-use formula with a sprinkler cap. You can just pick from the mentioned methods based on what you think is more convenient for you when dealing with specific weeds or grasses. It’s a versatile herbicide, too, in the sense that it is capable of killing and controlling the majority of weeds, grasses, and vegetation. It makes use of a multifunctional and well-balanced formula, which works effectively in most parts of your home, including the sidewalk, gazebo, fencerow, and patio. Grasses the Product Kills: What’s good about this vegetation killer is that it’s non-selective. In other words, it targets all kinds of grasses and weeds as well as unwanted vegetation from various parts of your home. It also prevents their growth for a year. 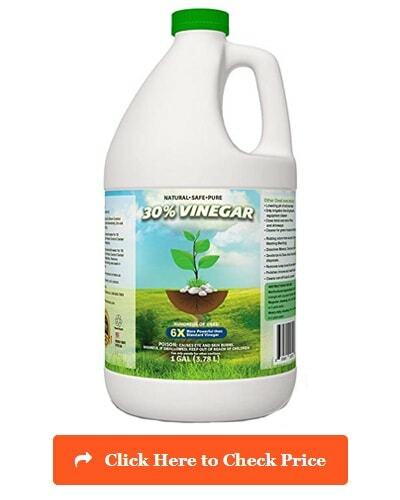 Another great option if you are in search of the best organic weed killer is the Eco Clean 30% Pure Vinegar. This product is worthwhile to check out if you really want to invest in a reliable, economical, and environmentally friendly weed killer. Note that this product can be used for a number of purposes but when it acts as a weed killer, you can expect it to fall under the selective contact type, which also works in killing and controlling pre-emergent weeds. Note that this organic weed killer delivers excellent results in a matter of just a few hours. However, it would be best to use it during the summer and spring when there is a lower risk of rainfall. It’s because the rain might rinse off the solution from the leaves, causing them to lose their effects. Once used, it will kill the grasses and weeds and prevent their growth for quite a long time. 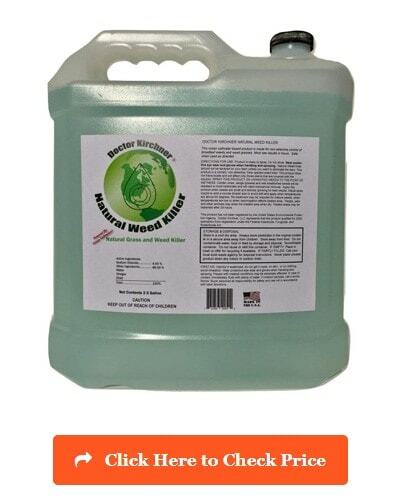 Eco Clean 30% Pure Vinegar works as an organic and earth-friendly solution when it comes to killing weeds, which makes it so special. It lets you take advantage of a safe means of killing and handling weeds and grasses in your garden without the need to use harmful chemicals. It is even possible for you to use it with other natural ingredients, like salt, as a means of increasing its potency. It targets annual weeds well and prevent such weeds from setting their seeds and growing. As it comes in its purest and most natural form, you are assured that you can safely use it around pets and children and in different parts of your home. Grasses the Product Kills: Annual weeds and grasses, Crabgrass, Stray and unwanted grasses, Broadleaf weeds. The best pre-emergent weed preventer also comes in the form of the Preen Extended Control, making it a good choice if you wish to deal with tough weeds and grasses before they ever grow. It falls under the selective systemic type of weed control and is designed to treat a decent area of up to 805 square feet. What is even more beneficial about this product is its ability to block weed for a max of 6 months after each application. Another advantage of this weed preventer is that you can apply it anytime during the growing season, whether it is fall, summer, or spring. Right after application, the product will begin to prevent new seeds from rooting and sprouting. It is essential to water the area after the application as it helps in activating the product. You can use a sprinkler, hose, or the rainfall (if expected) to water and activate Preen. 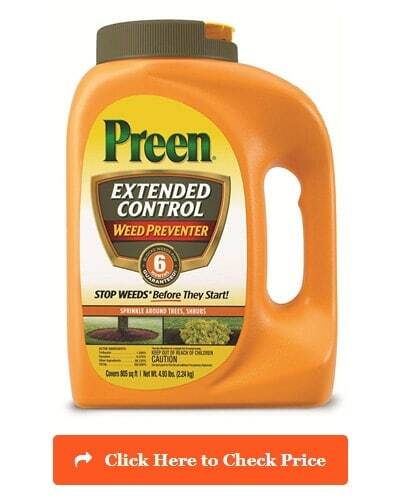 One of the most unique features about Preen Extended Control Weed Preventer is that it is long-lasting as it can block the growth of weeds for a maximum of 6 months after the application. It can also handle a wide range of weeds, including over 600 perennials, grasses, trees, shrubs, and groundcovers. It also boasts of the fact that it has a flip-top applicator cap as it promotes ease during the application process. The fact that it is possible for you to use and apply it anytime during the growth season is also a big advantage as it makes it one of the most convenient weed preventers you can use. It also works in various areas, like in perennial flowerbeds, rock gardens, and groundcovers. Grasses the Product Kills: Dandelion, White clover, Henbit, Crabgrass, Plantain, Chickweed, Field bindweed, Carolina geranium, Oxalis, Lambsquarters, Spurge, Stinging nettle. 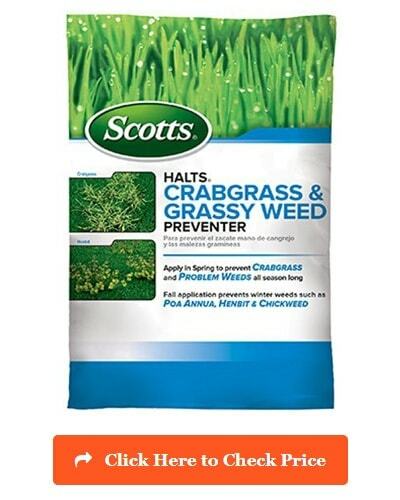 If your goal is to stop weeds, crabgrass, and other grasses from penetrating your lawn and causing damage the entire season then the Scotts Halts Crabgrass and Grassy Weed Preventer is your ultimate choice. It can be categorized as a selective systemic weed controller and preventer. A single application on a 5,000 to 15,000 square feet area can already prevent the growth of crabgrass and weeds all season long. It causes unwanted grasses and weeds to die and wilt within just a couple of days. To see immediate results, it is advisable to apply this solution during the spring, especially if your goal is to prevent the growth of problematic weeds and crabgrass. You can also apply it during the fall if your objective is to avoid the development of moss. Since this product targets pre-emergent weeds, it is appropriate for use on established lawns as it does not cause damage to the flowers and grasses you want to cultivate. In addition, it’s rainproof as it still works even if it’s raining or snowing. There are several reasons why you’ll love this crabgrass and weed preventer. For one, it’s really efficient in getting rid of crabgrass infestation without having to use harsh chemicals. Offered at an affordable price, you do not also need to spend too much just to be able to control the weeds in your lawn. It can prevent the sprouting of nasty weeds, like chickweed and henbit, too. Most of the ingredients used in this product are also safe. In fact, you can expect such ingredients to stay active for a long period regardless of the environmental condition they get exposed to. Furthermore, it’s easy to use and provides quick and lasting results. Grasses the Product Kills: Crabgrass, Foxtail, Yellow woodsorrel, Spurge, Annual bluegrass, Chickweed, Henbit. Another choice for the best lawn weed and crabgrass killer is the Bayer Advanced 704140. It is an excellent weed and crabgrass killer, which is ideal for use during their post-emergent phase. It’s a selective contact and systemic product, which makes it capable of working on selected types of weeds and grasses. What’s beneficial about this product is that it has a decently wide coverage. It can tackle up to 5,000 square feet area. It is best to use and spray this solution during the time when the weeds are still actively growing and small. Also, it is crucial to apply it when the temperature is lower than 90 degrees F. It is rainproof but you have to wait for an hour for this function to take effect. It tends to give you the results you want within 1-2 days after spraying. Expect it to work in just a single step without causing any harm to your lawn. One of the reasons behind the popularity of this weed killer is that it works as a highly advanced, all-in-one concentrated formula. 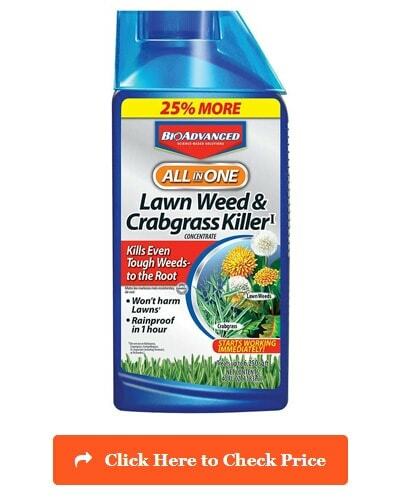 It works efficiently whether the ones infesting your lawns are weeds or crabgrass. It is also suitable for use on flowerbeds. In case you plan to use it on your lawns, you’re assured of its ability to kill a max of 200 weed species – that’s possible without putting your beneficial plants in danger. Another reason to love this product is that it utilizes a rainproof and non-irritating formula. You can use it whether you’re living in a rainy environment since you have a guarantee that the rain will never wash it off. Grasses the Product Kills: Dandelion, Clover, Crabgrass, Chickweed, Carolina geranium, Burning nettle, Ground ivy, Green foxtail. 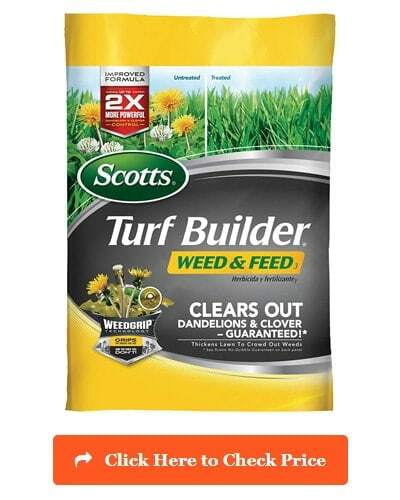 Another highly recommended product is the Scotts Turf Builder Weed and Feed Fertilizer. Many consider the weed and feeds fertilizer from Scotts a great product to invest in because aside from covering a wide area (around 5,000 to 15,000 square feet), it’s also multifunctional. It lets you take advantage of a weed killer and a lawn fertilizer in just a single product. When it comes to killing weeds, note that it can handle pre-emergent ones and falls under the selective systemic type. To guarantee an excellent performance, use it during the active growth phase of the weeds, especially during the late spring. The daytime temperature during the application should also be between 60 to 90 degrees Fahrenheit. It’s possible for the product to give you your preferred results in as little as 12-24 hours. During the 24-hour period, avoid watering the treated area to give its rainproof function enough time to take effect. One remarkable benefit of this weed killer and lawn fertilizer from Scott is that it makes use of an improved and new formula, which is two times as powerful when it comes to regulating and dealing with tough weeds, like clover and dandelion. It also makes use of the Weedgrip technology. What makes this technology special is that it applies a strong grip to weeds, whether they are visible or not, as a means of killing them efficiently. It also performs two functions – controlling unwanted weeds and thickening your beneficial plants and grass. It also does a pretty good job in clearing out your lawn from clover and dandelions. Grasses the Product Kills: Dandelions, Plantain, Mustard, Ragweed, Clover, Chickweed, Carpetweed, Bull thistle, Kentucky bluegrass, Ryegrass. If you are searching for a weed killer guaranteed to give you the highest level of strength then this super concentrate product from Roundup will definitely offer you satisfaction. This non-selective contact & systemic weed killer, which is perfect for both post and pre-emergent weeds can actually handle a really large area – up to 25,500 sq. ft. That said, it is safe to assume that this super concentrated product works for weed issues that are already widespread. One nice thing about this solution for weeds is that it has a rainproof function, which you can expect to take effect within 30 minutes of application. It is also possible for the product to show results in the form of wilting and yellowing within just 2-4 days. 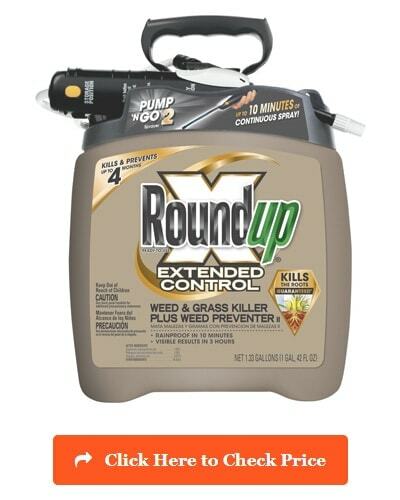 It is best to use it when the targeted weeds are already growing actively and do the application process during a sunny and warm weather – at least 60 degrees F.
This weed & grass killer from Roundup is special in the sense that it is really effective in handling widespread weed issues. It is designed to be used around trees, shrubs, and flowers. It is also ideal for use on large areas, like when doing garden plot preparation or lawn replacements. In addition, it is appropriate in several areas in your household, like in the driveway, gravel area, patio, and walkway. This just shows how versatile the product is. There is also a guarantee of its effectiveness in killing the weeds by targeting their roots, thereby preventing them from coming back. Furthermore, it works in a way that its killer power does not spread to those plants that you don’t target. Grasses the Product Kills: Bentgrass, Bermuda grass, English ivy, Poison ivy, Orchardgrass, Poison oak. You can also pick this Concentrate Plus version of the Roundup weed & grass killer if you wish to use the best concentrate weed killer. It is a good choice as it works for both post and pre-emergent weeds, making its performance more widespread. It is also a non-selective contact & systemic type of weed controlling solution. What’s even better about it is that its container can cover an area of around 1,500 to 6,000 square feet, which is already wide and decent. The product also utilizes the fast-acting technology, which is the primary reason why it can provide noticeable results in just 12 hours. In terms of its rain-proofing function, it’s possible for you to activate it within 30 minutes after you applied the solution. To enjoy favorable results from this fast-acting and concentrated solution, you should use it during a sunny and warm weather in an environment with more than 60-degree F temperature. 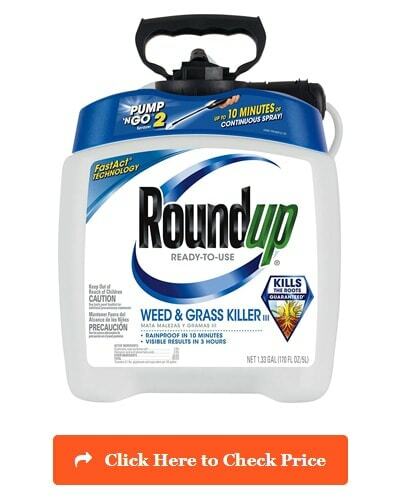 One reason why it’s worthwhile to invest in the Roundup Weed & Grass Killer Concentrate Plus is that it is effective in controlling and killing unwanted grasses, flowers, and weeds. It contains active ingredients, namely glyphosate and Diquate – both of which aid in getting rid of all the unwanted weeds from your lawn. What’s beneficial about this product is that it can attack the weed on the surface quickly. It also infiltrates its root, thereby ensuring that it does not grow back and spread to other parts of your lawn. As it uses the FastAct technology of Roundup, it is no longer surprising to see the weed and grasses decay within just 12 hours. Grasses the Product Kills: It is important to note that this product is a non-selective kind of weed killer and controller. With that in mind, all kinds of grasses that come in contact with the product will be killed. It’s designed to eradicate even the toughest grasses and weeds from the specific areas you treat. Another product, which falls within the non-selective contact and systemic category is the Roundup 5100110 Weed & Grass Killer 3. This pre-made weed killer spray can handle a 400 square feet area, which is already pretty decent for the size of its container. It also provides a good value for its price as it already works for both post and pre-emergent weeds. It is also one of those products from Roundup guaranteed to deliver quick results. In fact, you have the opportunity of seeing noticeable results in as little as 3-6 hours. In terms of its rainproof function, note that there is a guarantee for it to take effect within 10 minutes so avoid watering or exposing the area to rainfall within that short period. This product tends to perform really well when used during the active growth phase of weeds. Choose to spray this weed & grass killer at the time when air is calm as a means of preventing any drift to your beneficial plants. 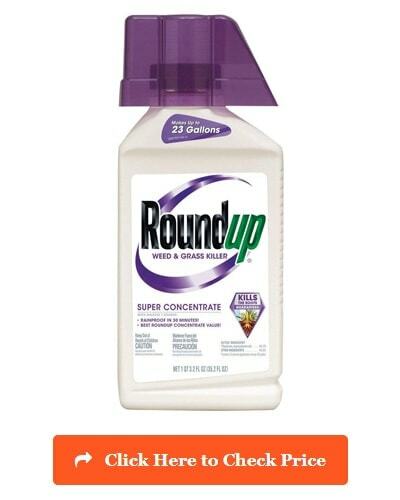 One thing that you will surely find so unique and special about this product from Roundup is that it utilizes a user-friendly, no-mix, and convenient formula. It’s manufactured in a way that it can kill grasses and weeds by attacking their roots, thereby cutting their chance of coming back. It guarantees a total kill. Different parts and areas of your home can also greatly benefit from this product. These include your patio, walkway, driveway, flowerbeds, mulched beds, tree rings, and vegetable gardens. It’s also guaranteed to handle cracks in your driveway. Furthermore, it is user-friendly as it comes with a sprayer as well as an extendable wand that you can use to spray continuously on the problematic grasses and weeds with the least effort. Grasses the Product Kills: This solution makes use of a non-selective formula, so it’s safe to say that it targets and kills all tough grasses and weeds present in your garden, lawn, or any other area you plan to apply it to. It can also efficiently kill poison ivy, woody brush, wild blackberry, Kudzu, poison sumac, and poison oak. If you are dealing with chickweed, clover, and oxalis infestation then you may want to use Ortho Weed B Gon to finally get rid of them. With the selective systemic nature of this product, it’s greatly possible for it to help you fully eliminate unwanted weeds and grasses from different parts of your home, especially the post-emergent ones. Available in a 16-oz. container, you have an assurance that this can treat a 3,200 square feet area. The best time to spray this solution is during the active growth of the weeds as well as at a time when the temperature is lower than 90 degrees and there is calmness in the air. This product can also bring out its rainproof ability 6 hours after you applied it. You’ll also notice its visible results after around 1-2 weeks of application. One special benefit linked to using this weed killer is the fact that it delivers an excellent performance whether you use it in a small or large area. It works well for spot treatments, too. It even features a comfort wand, which you can use to obtain a more precise control. With such control, you get the chance to spray this solution only in that specific area you wish to target. Another impressive fact about this product is that it is capable of killing more than 250 different weed and grass species, not just clover, oxalis, and chickweed. It does so without putting your lawn in danger. It’s designed to target weeds and grasses to the roots, thereby ensuring that they don’t grow for a long period. Grasses the Product Kills: Chickweed, Oxalis, Clover, Creeping Charlie, Black medic, Evening primrose, Wild geranium, Red sorrel, Wild violet dandelion, Pennywort. 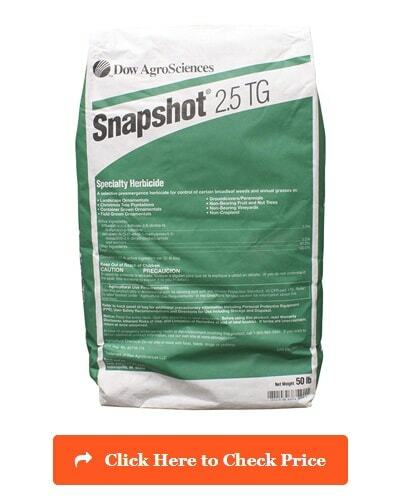 In case you are in need of a pre-emergent herbicide, which falls under the selective contact weed killer category then the best option for you will probably be the Snapshot 2.5 TG Granular Herbicide. One pack of this herbicide weighs around 50 lbs. and every 4.6-lb. of it is capable of covering a 1,000 square feet area. It guarantees to control and prevent the growth of the attacked weeds within 6 to 8 months after the application. The perfect time to apply this granular herbicide is during early spring, early fall, and late summer. Application should also be before irrigation or rainfall or after cultivation. Visible results can be expected after a few hours to a couple of days of application. It provides such results as it tightly bonds with the particles in soil while also boasting of its low water solubility, preventing it from moving away from the application zone. One special thing about this herbicide is that it offers protection against over a hundred annual grasses and broadleaf weeds. It tends to deliver its high level of protection without causing any harm to your lawn. It also provides a wide range of control towards weeds, especially for perennials, ground covers, non-bearing fruit trees, Christmas tree plantations, and field-grown and container ornamentals. It provides control and protection for a max of 8 months. Furthermore, it ensures that you do not need to do hand-weeding. It’s also considered as one of the best granular herbicides today because of its ability to offer full control over weeds surrounding ornamentals. Grasses the Product Kills: Crabgrass, Bitter cress, Chickweed, Oxalis, Spurge, Henbit, Russian thistle, Prickly lettuce, Pigweed, Dandelion, Scarlet pimpernel, Witch grass, Annual bluegrass. It’s also highly recommended to check out the selective systemic Spectracide Weed Stop for lawns if what you are looking for is a product with a professional strength when it comes to handling dandelion, crabgrass, and any other weeds and grasses in their post-emergent form. This 32-oz. product is truly capable of doing a really effective weed stop on a 16,000 square feet area. With the ability to kill more than 250 weed species, it’s safe to say that this weed killer can indeed give you full control over your lawn. In fact, applying it once will let you enjoy and see its results within just eight hours. It’s also a big help in terms of dealing with troublesome grass weeds, like chickweed, clover, crabgrass, dandelion, and broadleaf. The treated area tends to become rainproof after 6 hours. 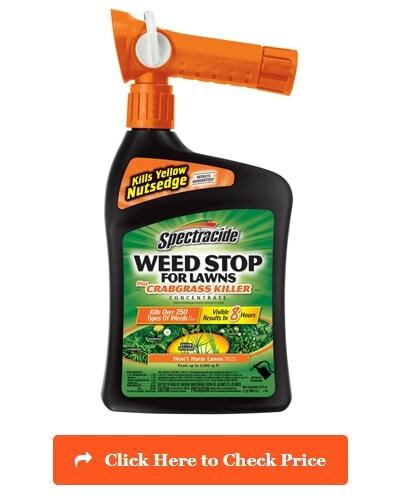 It’s best to use this weed stop and killer from Spectracide during the spring season and the fall. What’s good about this solution from Spectracide is that it works in a systemic manner, which means that the weed absorbs it and transports it all throughout the plant, killing it in a gradual yet sure manner. Another special fact about this solution is that it can produce consistent results while working in a gentle and safe manner. Since it makes use of a gentle and safe formula, you have a hundred percent assurance that the area surrounding the targeted weed won’t get damaged along the process. It’s safe and gentle for the environment, too. It also serves as a perfect day-to-day weed killer as it guarantees quick and long-lasting results. Grasses the Product Kills: Bitter wintercress, Blessed thistle, Carolina geranium, Crimson clover, False dandelion, Stinging nettle, Poison ivy, Spiny amaranth, Redroot pigweed, Narrowleaf plantain. 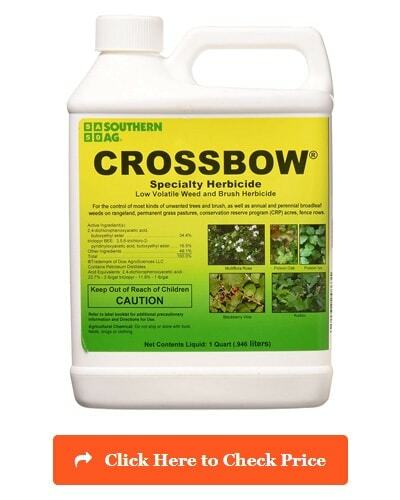 Another product that falls under the selective systemic herbicide category is the Southern Ag Crossbow Specialty Herbicide. One major advantage of investing in this product is that it delivers an excellent performance if you decide to use it in pre and post-emergent weeds. It can also handle a huge area, up to 22,000 square feet. One special advantage associated to using the Southern Ag Crossbow Specialty Herbicide is that it provides a fine control over woody plants and brush. It also performs its function without harming other grasses that you do not want to target. It is a convenient weed and brush killer, too as you have the option of applying it using all types of sprayers, including handheld and tractor-mounted ones. This product also works perfectly when used on non-crop areas, grass pastures, and rangelands. It also delivers an impressive result when used on non-irrigation ditch banks, industrial sites, fence rows, permanent grass pastures, and roadsides. It is also suitable for use on broadcast treatments or spot applications. Grasses the Product Kills: Blueweed, Field buttercup, Burdock chickweed, White sweet clover, Ragweed, Hairy goldenrod, Poison ivy, Poison oak, Annual and perennial broadleaf, Bluebur buttercup. 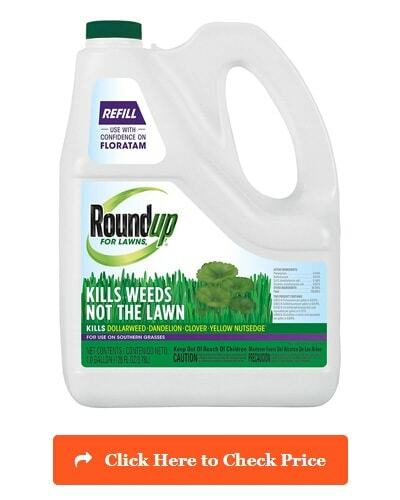 If you are looking for a selective contact and systemic weed killer designed for Southern lawns and grasses then the Roundup for Lawns RTU Refill is definitely a nice choice. Many consider this special formula as a godsend in terms of dealing with annoying post-emergent weeds and grasses. Covering a wide area of 1,000 square feet, it is capable of nipping the roots of the problem, killing them right after contact and preventing their regrowth and germination. It makes use of a fast-acting formula, making it possible for it to kill and destroy the weeds upon contact. Such can give you your expected results in just a few hours. It also has a rainproof protection, which takes effect after 4 hours. It is highly advisable to make use of this product in the early summer season or during spring. 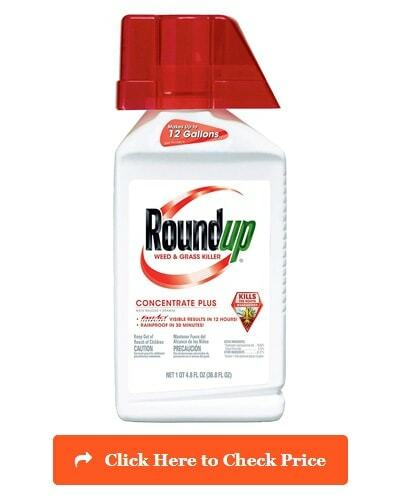 The daytime temperature during application should also be around 45 to 90 degrees F.
If you are wondering what kills weeds permanently then this product from Roundup is the answer. It is special in the sense that it makes use of a formula, which specifically targets Southern grasses. It also offers an assurance of its ability to kill weeds without harming your garden or lawn. The product is even capable of controlling more than 25o lawn weeds, grasses, and roots, even those hard and tough to kill ones. It lets you enjoy a weed-free and beautiful lawn through its ready-to-use and convenient refill formula. It is easy to control and use – thanks to the extended wand bottle that comes with it as well as the fact that its use does not involve any mixing. Grasses the Product Kills: Dollarweed, Yellow nutsedge, Clover, Dandelion, Centipede grass, St. Augustine grass, Bermuda grass. Managing weeds is actually a tough and challenging task for a lot of people because of several reasons. One reason is that these weeds tend to grow faster in comparison to beneficial plants. You can also expect them to survive in most soils and environmental conditions while starving your lawn of nutrients, causing the stunted growth of your plants. The first factor you have to consider is the specific type of weed you wish to target. Note that the best herbicide for you is that which is capable of killing the specific weed species that are thriving and invading your home and lawn. Before making your purchase, spend time examining the unwanted weeds and invaders that grow in your lawn or in any other areas of your home. Among the weeds that you may have to deal with are annuals, such as foxtail and crabgrass. Your lawn may also have perennial weeds, such as dandelions, plantain, and nutsedge – all of which are more difficult to control when compared to the annuals. Research about the specific weed that you’re dealing with. That way, you can find an herbicide, which is really effective in doing complete weed kills and control. Another factor that you have to consider is the effectiveness of the product. Prior to buying, you have to conduct an extensive research about its effectiveness in killing weeds in your lawn. You will also learn about the effectiveness of the product by studying its main ingredients as well as reading legitimate customer reviews. The best product continues to receive positive reviews from its users. It is also crucial for you to decide on the type of weed killer that you have to use. Will it be the contact weed killer, which kills only those plants and weeds that come in contact with it? Or will you choose the systemic weed killer? You can actually make your choice between these two types by figuring out the majority of weeds and grasses that are presently thriving and invading your space. Before you make your purchase, it is also advisable for you to determine the specific purpose you wish the herbicide to fulfill. Is it going to be to prevent the emergence of weeds? Or is it to get rid of the already growing ones? In this case, you have a choice between the post-emergent and the pre-emergent herbicides. If your goal is to prevent weeds then go for the pre-emergent type. However, if you want to target those grasses and weeds that are already thriving and growing then the post-emergent weed killer is right for you. It is also crucial to decide based on the specific amount of herbicide or weed killer you need. If you wish to treat a small area only then it would be more convenient for you to use a ready-to-use herbicide, which you no longer have to dilute with water. However, if you’re planning to treat a wider area with plenty of weeds then it’s advisable to pick a concentrated product, which is known to be more economical. Avoid buying an herbicide without calculating the area you’re planning to treat first. This will give you an idea about the size or weight of herbicide or weed killer you specifically need. It also ensures that you won’t be storing too many herbicides in your home that you no longer need. Another important consideration is how easy it is to use the weed killer. Avoid buying one, which requires complex steps when it comes to its use and application. You should have an easier time preparing it. Furthermore, it should have a straightforward application. That way, you can use it to manage weeds in your lawn and garden with ease. Another thing that you have to do prior to buying is to check the formula and components used in the herbicide. It should have a high level of safety. It should be non-toxic and should contain non-irritating ingredients. If possible, go for a natural one, which is not harmful to the environment as well as to the people around your home and your pets. Once you have made your choice, do not forget to read the instructions indicated on its pack carefully. Note that each product requires you to follow a different formula for blending water and ingredients so you really have to dedicate some time reading its instructions. You need to follow all the instructions precisely to guarantee a more successful experience when controlling and managing weeds. As the name suggests, a homemade weed killer is a solution that you can prepare at the comforts of your own home using certain ingredients. Fortunately, it is not that hard to do considering the many homemade weed killer recipes that are now introduced on various sources, like in the internet. The majority of these recipes actually make use of certain ingredients that you can find at home, including salt, vinegar, and soap. One option for the best homemade weed killer that you can use is household vinegar, which has around 5% acetic acid concentration. What’s good about acetic acid is that it’s a desiccant, which means that spraying it on a plant’s surface will draw out the moisture from its leaves, thereby killing its top growth. It’s actually effective if you’re dealing with invasive plants, like Canada thistle, and some weed species, especially young ones. However, it’s not that effective when used on more mature weeds and perennials with more developed and robust root systems because it only works in killing the topmost part of the plant. Just like vinegar, you can also expect salt or sodium chloride to work as a desiccant. You can add this in a homemade herbicide recipe because of its ability to deal with those unwanted plants that vinegar can’t seem to kill. Salt is really potent and powerful in the sense that it works effectively in killing and getting rid of unwanted plants, grasses, and weeds. However, it also has a disadvantage as it has a long-term negative impact on the soil. It also tends to negatively affect the roots of those plants that are close to the ones you’re targeting. Citrus oil works as a homemade weed killer because of its ability to strip the waxy coating from weeds, causing them to get dry. It also contains d-limonene, an active ingredient, which tends to result from squeezing oranges right after removing the juice. It is beneficial, especially when used on pathways. Another advantage of citrus oil is that it is easy to use and spray. It’s also safe to use around kids and pets. One problem with citrus oil is that it is not as strong compared to commercial weed killers. You might also need to use several doses of this solution just to produce your desired results in terms of killing weeds. Prior to applying your chosen weed killer or herbicide, it’s essential that you carefully read its label. The label will give you information about the specific purpose of the product, safety information, instructions on proper usage, disposal and storage, as well as its level of toxicity. It will also give you a clear idea about the protective equipment and clothing that you need to apply the weed killer. Make sure to stick to what’s instructed in the label to guarantee your safety. Again, check the label of the product to determine the best time and temperature to apply it. Follow it to avoid amplifying the stress experienced by your beneficial plants and grasses. Spray during wind-free days, too. Do not forget to wear gloves during the application as the chemicals in the herbicide might cause eye and skin irritation. Do that, especially if you are planning to use a broad-spectrum weed killer, like those containing glyphosate. 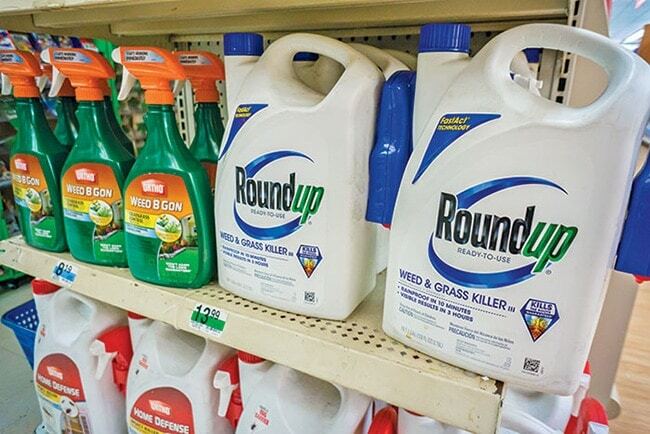 Since this type of herbicide has the tendency of killing the majority of plants it comes in contact with, you have to be really careful when targeting those that you want to get rid of. One way to handle this is to utilize a weed wand. You may also soak a cloth or sponge into the solution and paint the weeds with it instead of spraying. Such ensures that it will hit its target. Twenty-four hours is usually the standard period of waiting before you can let the treated area get exposed to rainfall or irrigation. It is because most herbicides are designed to stay in the foliage for that period to work. Before applying, check whether no rain or irrigation will happen so you can spray accordingly. During a hot weather, it would be best to water your lawn one day before the application of the weed killer as this will provide the area with more resilience. 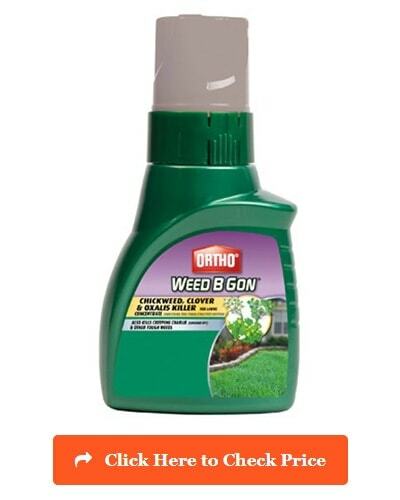 Note that this product needs to be absorbed by the weed’s leaves. If the weeds are short because of mowing then there’s a great possibility that it will only absorb less chemicals. If you need to mow the lawn then wait for a few days first after that before you start spraying. With these tips, you have a higher chance of killing all the weeds in a safe and successful manner. Make it a point to attack them as early as possible so you will have an easier time fully eliminating them. Pesky weeds and unwanted grasses have the tendency of ruining the appearance of a meticulously and carefully manicured lawn. Fortunately, it is no longer that hard to find the best weed killer today considering the numerous choices that are now laid out to those who are interested in buying one. What’s good about most of these products is that they are capable of killing various weed and grass species without damaging the other plants in your lawn. Just make sure to spend time comparing all your options and figuring out your exact needs and requirements. That way, you can make an educated decision, which can help you finally manage the weeds in your garden and lawn.